Formed in Belo Horizonte, Brazil in 1984, Sepultura quickly rose to the top of the Metal genre. With a sound that was as inventive and exuberant as it was raw and primal, their earlier albums helped shaped the sound of a whole new strain of heavy music. The band shattered preconceptions and firmly planted South America on the metal map. 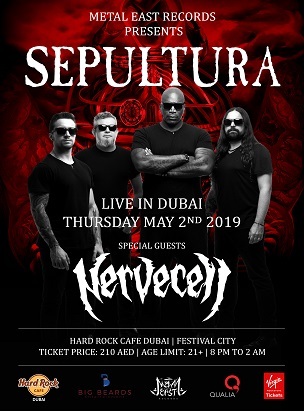 May 2nd 2019 will mark yet another historic day in the Middle Eastern Metal Scene. Sepultura have released an album that once again reaffirmed the band’s status as standard bearers for heavy music. Recorded with esteemed producer and engineer Jens Bogren (Opeth/Kreator/Ihsahn/Paradise Lost) manning the controls, “Machine Messiah” is also quite simply the most complete and absorbing album the band have made in the Derrick Green era. Thrillingly broad in musical scope but always firmly rooted in the spirit and fire of no-nonsense heavy metal, it is clearly an album that the band have crafted with great love, passion and determination.